Siguenza, Castile la Mancha, Spain. Purported to be twelfth century, the origins of this fortress are even earlier – it is, after all, on the site of a 5th century castle which was “upgraded” by the Moors in 712 AD. It is said that this original building was captured by El Cid and thence transformed into a bishop’s palace. Of course, the castle of Siguenza’s heritage is far too complex and rich to describe in limited words here (an expert in Spanish history would do it more justice than we could ever achieve). But even those with just a passing interest in times-past would not fail to appreciate its historic importance. 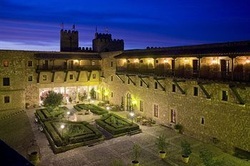 Grand in scale, it is no surprise that the Parador de Siguenza offers over 80 guest rooms. It also features a restaurant specializing in traditional-style cuisine, and its very own 13th century chapel.